White Wolf has partnered with Asmodee Digital to create two new mobile games, one based on Vampire: The Masquerade the other on Mage: The Ascension. In a previous post, I reviewed the Vampire game, We Eat Blood. 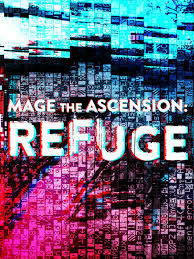 I've finally had a chance to check out the Mage one, Refuge. In short, while it falters as a game, it's a gripping and enjoyable short story, and it feels like at lease some of your decisions actually matter. It's difficult for me to review Refuge without subconsciously comparing it to We Eat Blood. But, each deserves to stand, or fall, on their own merits. As such, this review will be divided into two parts. Part one will look at Refuge on its own terms. Part two will be a comparison of the two, for those who are interested but undecided on which, if any, to check out. The writing The writing in Refuge is fantastic, and easily the strongest element of the game. I've never had a chance to read any of Karin Tidbeck's writing before, but after this, I'm eager to seek out more of her work. The world she paints initially is lived in and believable, which allows the more fantastic and bizarre elements to stand out all the more strongly. All the characters seem to be real with their own lives and goals; even the most minor of walk on characters. I felt like I knew these characters, that they were part of my life, and I cared about what happened to them, and how my increasingly bizarre. world might affect them. The characters You play as a specific, defined character. You don't get to pick your name, age, background, or anything else. You're Julie, a bookstore clerk by day, volunteer by night. While some may balk at such specificity, it really is HER story, and by making her world feel real and alive, the game takes on a more universal appeal. The other characters are very well drawn, even those with only a short appearance. You know them, they know you, and that's sometimes all you need to care about what happens. The art It's a pretty straightforward interactive narrative. The only creative bit when it comes to art is when your character experiences magic, or magick. Then, the screen blurs and fades and static takes over, and it really feels like the world is out of control and unpredictable. It's a neat effect that makes what is essentially text on screen feel more dynamic that it has any business being. The choices It's interactive fiction, so the draw is the story, not the "game." And while some choices seem meaningless, and the narrative is going to move forward regardless, others seem to have more weight. Some I felt like I was choosing at random, particularly the more mystical and bizarre choices left me stabbing at the screen just because. I didn't really understand the symbolism of what I was seeing, and I could only guess with the author was thinking. Eventually, I stopped worrying about it and just made "gut" choices. I don't know the difference symbolically between an airship and the underground, but, dammit, I've always dreamed of being on an airship, so we're going that way! But, at the end it DOES seemed to have mattered. You're choices decide not only the end of the game, and who you stand with, but the fate of the world around you. You're not just concerned with yourself, but with everything. The world is no longer on the precipice, but has begun the slide towards its destruction. Do you look to the past and it's golden ages for wisdom and guidance, embrace the future and hope that the only way out is through, or give into nihilism and the blind faith that after this world ends, whatever comes next can't be any worse? I highly recommend picking this up. Yes, it's interactive fiction, which if you hate won't work for you. But, if you're willing to go on such a ride, this is one to check out. It's almost unfair to compare these two. They're telling different stories with different themes and needs. Personally, I prefer Refuge. The characters feel more real, the choices seem to really matter, I felt far more connected to the main character, and was far more engaged the whole way through. Also, the plight of desperate refugees on the edge of the world seemed more pertinent and engaging than strung out hipsters in L.A.
Also, while Blood often has a specific path through the story, and failure results in death, Refuge follows your choices however you go. As such, Refuge felt far more like a real "prelude" in the White Wolf RPG sense. The both have their positive and negative qualities, of course, and both are worth checking out. If you have to pick just one, go Refuge, but pick up We Eat Blood when it goes on sale. They're both a journey worth taking. It's also made me incredibly excited to see what the do with Mage going forward! Mage the Ascension: Refuge and Vampire the Masquerade: We Eat Blood are available for Android, IOS, and PC.